Statue of Confederate General Stonewall Jackson overlooking the fields from Henry Hill where the first Battle of Bull Run was decided in 1861. MANASSAS, VIRGINIA–We’ve had several posts in this blog on the geology of battlefields (Leningrad, the Meuse-Argonne, Vicksburg, Bear River, Brice’s Crossroads). These places are almost always beautiful: peaceful green fields, quiet forests and grass-covered hills which belie the tragedies they hosted. In each there is some aspect of the underlying geology which shaped the landscape and provided obstacles or advantages for the combatants. Often the geological features are dramatic (like the chalk cliffs and ridges of northern France), but sometimes they are subtle. 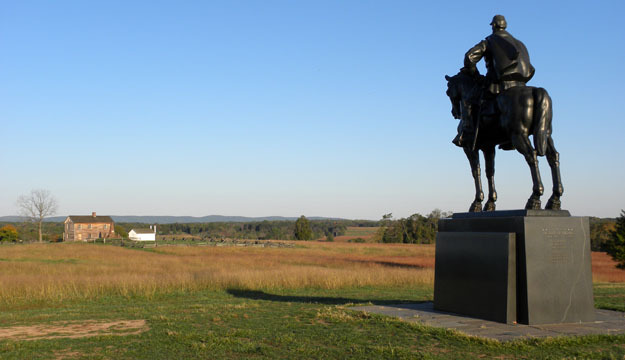 The two Civil War battlefields at Manassas (The First and Second Battles of Bull Run) are examples of the latter. The Henry House on the Bull Run battlefield in Manassas, Virginia. On this beautiful October day my wife Gloria and I explored Henry Hill in Manassas, where the First Battle of Bull Run had its most critical moments. The landscape there is subdued with low hills and shallow valleys. The smallest rises and hollows made all the difference as the Confederate and Union soldiers fired at each other for hours. The Bull Run battlefields are in the Culpepper Basin, a Late Triassic to Early Jurassic half-graben formed during the rifting of North America from Africa and Europe. The basin filled with thousands of meters of sediment, most of it terrestrial in origin (from lakes, rivers, streams, alluvial fans). The unit forming the foundation of Henry Hill is the Groveton Member of the Bull Run Formation (Upper Triassic). Turns out the Groveton is mostly siltstones and shales with a few resistant coarse sandstones. It is these sandstones that are slightly more resistant than the other lithologies, so they made the small protrusions that either gave artillery regiments firing platforms or sheltered infantry sprawled on the ground behind them. The sand was deposited by meandering rivers across the Triassic landscape. These seemingly random ancient river bends ended up making the difference between life and death on an American battlefield. Resistant sandstone in the Groveton Member of the Bull Run Formation (Upper Triassic) exposed on Henry Hill. 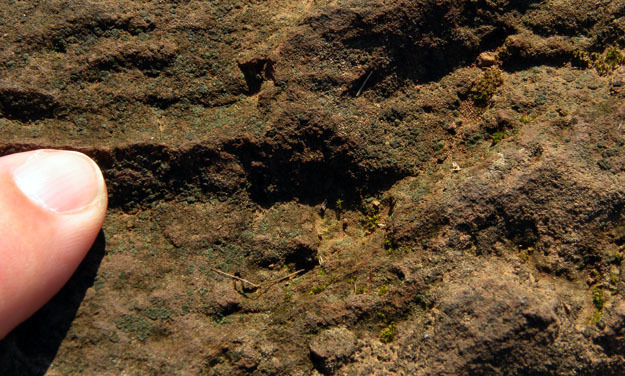 Closer view of an exposed sandstone in the Groveton Member on Henry Hill.